Treat your family to this luxurious, first floor, beachfront home poised in “America’s Greatest Family Resort” at 4125 Central Avenue. Meticulously appointed with patio furniture, indoor/outdoor sound system, and gas barbecue grill, the majestic 25′ x 40′ beachfront deck is perfect for a family cookout or sunbathing! Relax as you listen to the seagulls, waves breaking against the shore, and smell the salt air through the whispering ocean breeze. Walk a few steps to the lifeguard protected beach through the picturesque dune path located directly in front of this tranquil vacation get-away. There’s something so enchanting about the rhythm of the ocean. Ocean City is the premier beach where memories are made! This lovely vacation home is ultra-clean, well maintained and tastefully decorated. It has been completely renovated for the 2019 season! 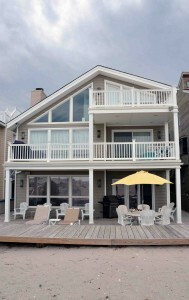 The deck and the interior living area are much larger than most of the homes on the island. Comfortably sleeping eleven, this home has four large bedrooms with closet space and two full bathrooms.